The Costa Blanca therefore offers both varied temperatures and landscapes. Starting at its most northern point in Denia you are able to travel it’s entire length via the ‘Autopista’ motorway which runs along the coast from Denia to Torrevieja at its southern point. Of course travelling inland is the most beautiful route and you will enjoy splendid mountain views, passing many small villages, caves, gothic churches, towns, castles and local landmarks. On the Costa Blanca North, you will find many beautiful Mediterranean beaches (many with the European Blue Flag), sand dunes, watch towers and natural caves. Many of the towns are fishing ports and have harbours where many luxury yachts are moored. 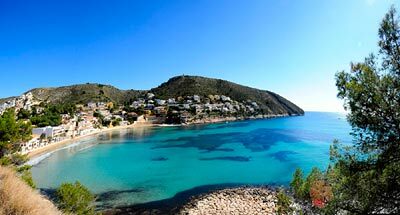 Starting at Denia, with its famous castle, and harbour where you can catch a ferry to the Balearic Islands, you can travel over the Montgo mountain to Javea and then on to the old fishing port of Moraira. Further south is Calpe, with its nature park at Peñon de Ifach (which is a rock jutting out to sea), then Altea which has a rural district and an ‘old Town’. Continuing along the coast, is the ‘entertainment capital’ of Benidorm, with its two famous beaches, skyscrapers, live shows, discos, Theme Park, Aqua Park and Marine World. Alicante city is at the heart of the Costa Blanca and divides the Marina Alta area (North) from Marina Baja (South). It is a thriving cosmopolitan city and is a leading centre of commerce, culture and tourism. It’s seafront promenade, the Paseo de la Explanada along the 7 kms of sandy beaches, is the place to be seen with its many street cafes and palm trees, and the city itself has many excellent shops, restaurants, museums, monuments, cultural activities and regular fiestas. The area inland Costa Blanca North has some of the most beautiful scenery in Spain. Whether you choose to visit or live in the ‘campo’ away from civilisation, or in one of the small Spanish villages where you will find narrow streets, domed churches, quaint little shops, a town square (Plaza) and become immersed in the local community -(as opposed to coastal life), you will almost always have views of mountains, vineyards, orange trees, olive trees or lush green areas.